Most of the ancient ruins in Italy you see are, not surprisingly, Roman. 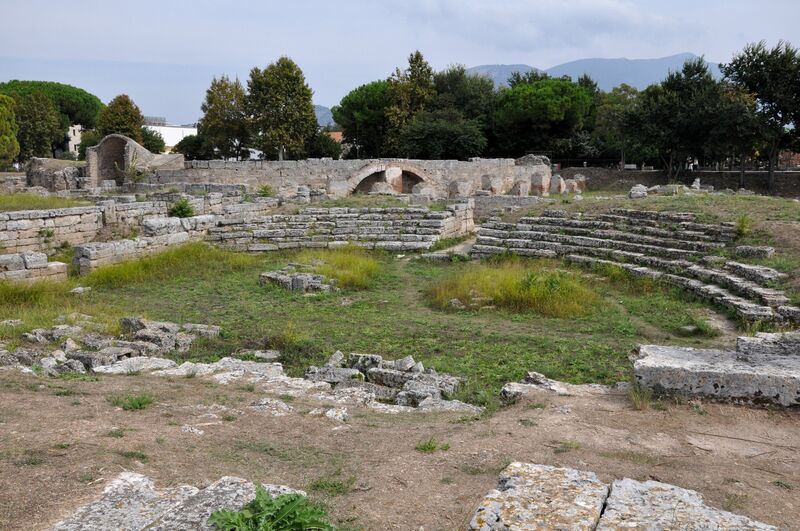 But just an hour south of Salerno is something different… and much older: Greek ruins. The ancient ruins at Paestum are among the only Greek ruins left on Italy’s mainland, and they’re definitely the best-preserved. (Many more wonderful remnants of ancient Greece can be found on the island of Sicily). 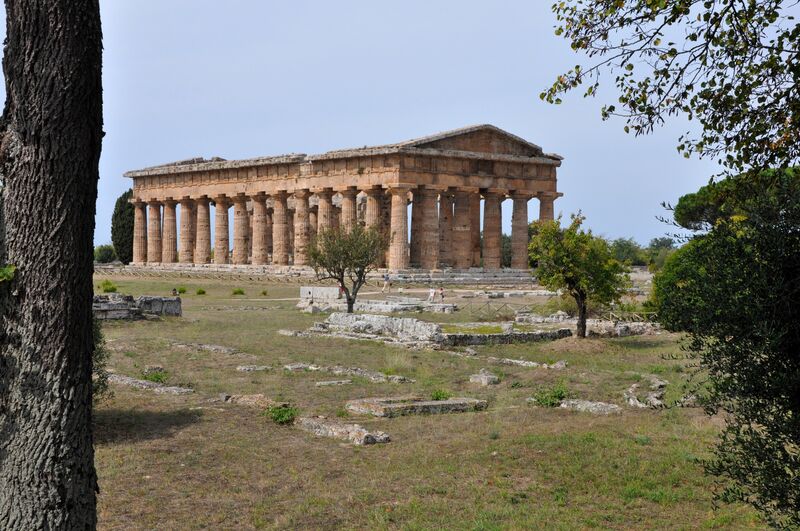 Plus, although you’re probably used to hearing all about men and male deities when it comes to the ancients, this site is a nice example of how that wasn’t exactly the case: All three of Paestum’s major temples were built in honor of female goddesses. The site also has a gem of an archaeological museum, with some of the most important finds of the Greek and Etruscan civilizations. Another bonus? 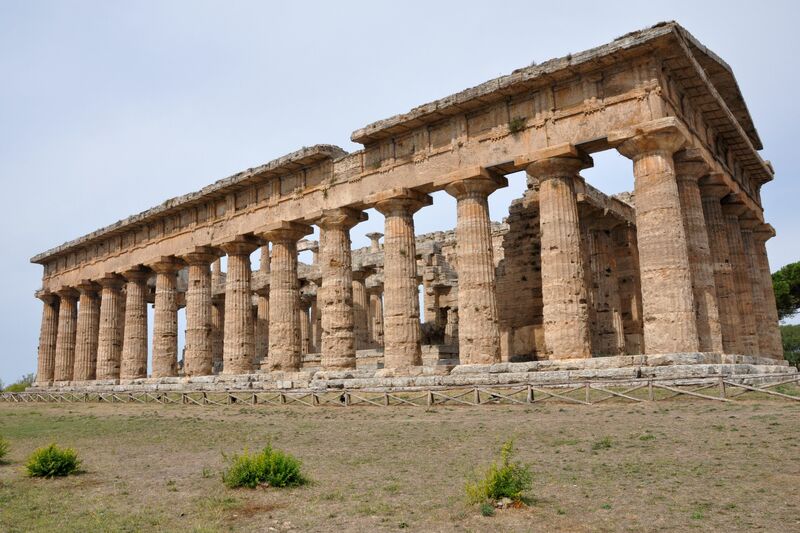 Although Paestum is, of course, a tourist site, it’s well off the beaten track—meaning that, depending on the season, you might be almost alone with the temples. Founded in 600 B.C. 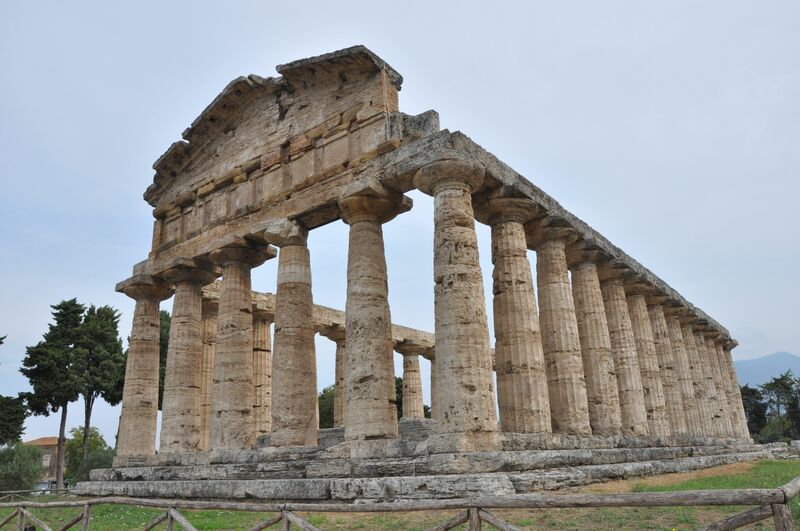 by the Greeks, Paestum was conquered by the Romans in 273 B.C. While you can still see the archaeological signs of their conquest today, the best-preserved, and most spectacular, ruins in Paestum remain Greek. The middle of the three temples, the Temple of Hera II, is the one that awes the most. (Your guidebook probably calls it the Temple of Neptune; archaeologists now know that it was dedicated to Hera, the goddess of women and marriage, thanks to worshippers’ votive offerings found buried in pits close to the temple). Dating all the way back to 450 B.C., the temple is completely intact, except for some of the inner walls and the roof. It’s in such good shape, in fact, it’s one of the best-preserved ancient Greek temples in the entire world! It’s also absolutely massive: 195 by 80 feet. The Temple of Hera I was the first temple of the three, as well as the first one dedicated to Hera. (We know that because, again, of the votive offerings. Most are female terracotta statues with the Greek letters Η (eta) + P (rho) + A (alpha): Hera). Even here, though, there’s been confusion: Earlier archaeologists thought it was a Roman public building, so dubbed it the “Basilica” of Hera. While smaller than the other one, it’s still huge. Its date? 550 B.C. Then there’s the Temple of Athena. A small, lovely temple that’s also been (mistakenly) attributed to Ceres, it was dedicated to the goddess of war, wisdom, and heroism. Dating back to 500 B.C., it was later used as a Christian church. Once you’ve taken in these stunning temples and their surrounding ruins (don’t miss the Roman amphitheater, of which you can only see half thanks to an insensitive decision in 1930 to bury its northern half with a new road), head to the site’s Archaeological Museum. While you’re there, don’t miss the incredibly well-preserved ancient tomb paintings, all found by accident in 1969 by an artichoke farmer (!). 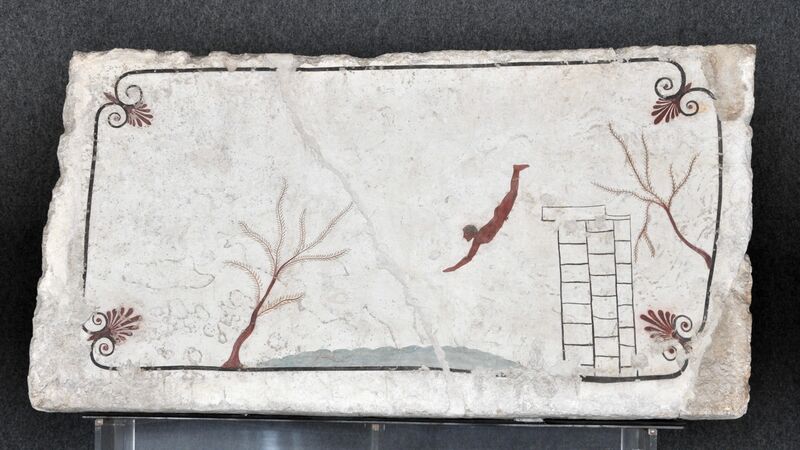 The most famous of them all are the frescoes from the Tomb of the Diver. Although they look like they were painted yesterday, they were painted back in 470 B.C. Some pictures show men frolicking at a funerary banquet. The most famous, though, shows one solitary figure leaping into the water, an image that’s been interpreted as a stunning metaphor for death—and the only image like it ever found. If you go, just remember that the archaeological museum is open daily from 8:45am-7pm, except for the first and third Monday of the month. The archaeological site is open from 9am daily and closes an hour before sunset. It’s only 6.50 euros for both. You don’t need more than a day in Paestum, so in general, we wouldn’t recommend staying over (the restaurants also seem quite touristy, which is never ideal for the place you’re staying overnight at!). But Paestum is an easy day trip from either the Amalfi Coast’s Salerno (one of the reasons why we’ve recommended using Salerno as a base before!) or Naples. 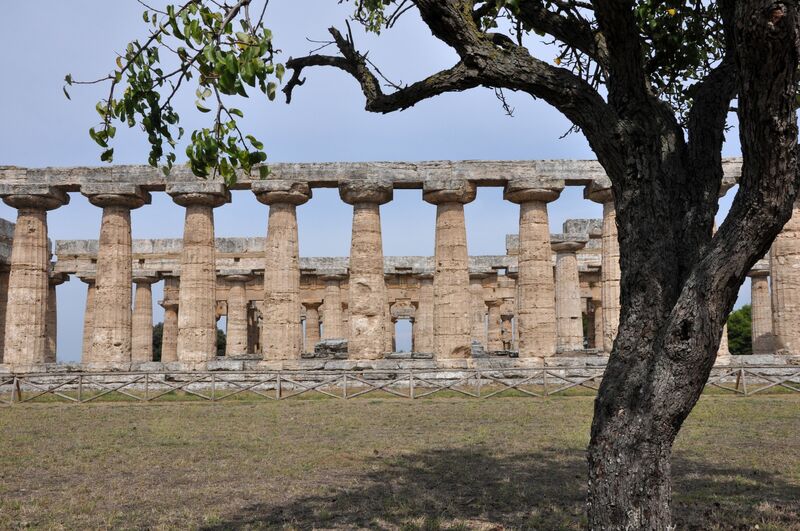 For the site, you want one of two stops: either Paestum or Capaccio-Roccadaspide. You can either take the train directly from Salerno to Paestum (a 30-minute ride) or from Naples to Paestum (a 1.5-hour ride). There are also buses, which are slower but can be cheaper, including from Salerno to Paestum through CSTP (line 34), SITA or Autolinee Giuliano Bus (lines 3, 4, 5, 6, 7, and 10). CSTP also connects Naples with Paestum, as does Autolinee Giuliano Bus. Wow.. I didn’t know about Paestum. I’ve been to Valle dei Templi in Agrigento, and it was amazing! I walked all the way around this massive complex in 2008. It’s very large and the grounds are raised above the roads. The architecture is stunning. And I went there to visit the site of the Italian Invasion of 1943, knowing ruins were in the area, but not paying attention to them. Go prepared to spend a full day. Was just at Paestum today, a jaw-dropping collection of ruins, very impressive. I couldn’t believe there weren’t more people there, the place was almost deserted and on a Sunday too! Since this article was written the price for museum and archeological site entrance has risen to €10.